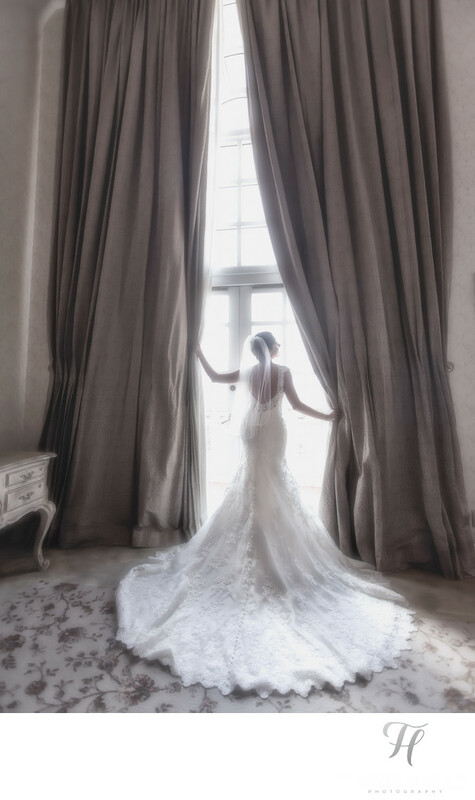 This image of Jackie was shot at the Hyatt Regency Coral Gables and is a very timeless and elegant capture. I have over exposed this image to give a slightly washed out look. I really love this shot, because it shows her beautiful wedding dress so well, and the tones in the room are very “regal”. I have done shots like this in the past, and even have a few more on this very gallery, and while they all might be a little similar, they also are very different and I really think this one stand out and is why I am showcasing it. Although the basic idea of a shot like this is incredibly simple, the execution can be a little more complicated. For example, the pose. I needed to be sure that I have her bending a leg to give some shape to her wedding dress. This also helps her hips move to one side, and starts to set the tone for the rest of her body. Then, comes the arms. I wanted them to compliment one another, and having one a bit higher then the other really made for a great "flow" The last little detail here, is in her head position. I needed to be able to see some of a side profile, and also needed her to rise the chin a bit. The last part, was getting the bottom of the dress perfect. LOL. So, all in all shots like this do take a bit of finesse and practice. One thing is for sure. I LOVE this room in the Hyatt Regency Hotel and have made a video talking about how much I love this place. Be sure to check out the full blog post here.